We are Leading Supplier and Manufacturer of Laboratory Oven such as Vacuum Oven, Hot Set Oven, Multi Cell Ageing Oven and Hot Air Oven from Thane. Hot Set Oven samples are introduced through a small opening in the top of the oven. To get a suitable working height and not shake the samples during insertion, the oven is fixed and the sample holder moves up and down by a servo motor is driven screw system. The oven has a controlled air exchange rate and low air speed which can be controlled by a flow meter, meeting the requirements for ageing ovens in IEC 811. Measurements are made through the window with a laser pointer mounted on a measuring scale placed on the door. The window can be taken apart for cleaning. With a push of a button on the scale the measured values are entered in an Excel template when measuring the elongation. The set is measured outside the oven with digital calliper also connected to the computer. 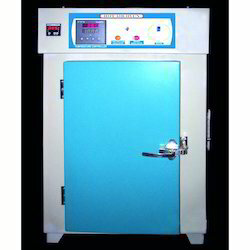 We produce Laboratory Hot Air Oven in which the outer chamber is made of mild steel with powder coating and the inner chamber is made of stainless steel. The temperature of the hot air oven is controlled with the help of Digital Temperature controller. The heating elements are made of chrome plated nichrome wires.